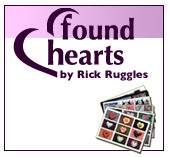 Here is my blog about my passion – Found Heart photographs. I don’t think I could avoid seeing them if I tried. So I keep seeing them everywhere, and take pictures of them, a couple thousand by now.